The recent wave of executions, death sentence implementation orders, and widespread detentions in Iran have ignited the protests of people inside and outside of the country. These events demand a response from governments worldwide and their organizations. Yet once again, governments and the United Nations refuse to act substantively and in the interests of Iranian people. 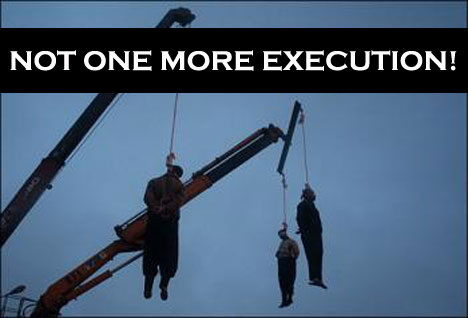 The killing in Iran cannot continue without response from the world’s governing bodies. There is a need, and a demand, for a call to action with a clear demand, target, and objective – an action that is an effective yet ethical alternative: a diplomatic sanction, simple and within reach of the UN as a collective action, as well as for individual member states. The UN, along with every individual member state, however, has unfortunately kept a deafening silence during the current slaughter – as they have for the past 32 years. This is not tolerable! We, the honourable people of the world, will not allow this! We demand action! We believe the protest actions on January 29 are an attempt – one of many to come – to mobilize our many forces across the globe to send a clear message to the world governments, the UN, as well as the Islamic Republic of Execution and Imprisonment. We say: Enough is enough. We hold them all responsible and we will enforce our demands. In the face of the executions and attacks on people in Iran, a unity has developed across the various groups that oppose the violence and bloodshed of this regime. We welcome this unity. With this unity behind a common objective, we ask all honourable people worldwide, Iranian and non-Iranian, to consider the demands of the January 29 protest action: join us to put an end to 32 years of mass killings, executions, and imprisonment and torture of Iranian political, human rights, and labour activists. Join us on January 29th, and thereafter. Together, we have the power to do this.